To those of us who live in more temperate climates like New England, it’s pretty crazy to think that there are some states here in the USA where people have to deal with alligators as part of their everyday lives. I mean, just look at those things – they’re basically freakin’ dinosaurs, for crying out loud! 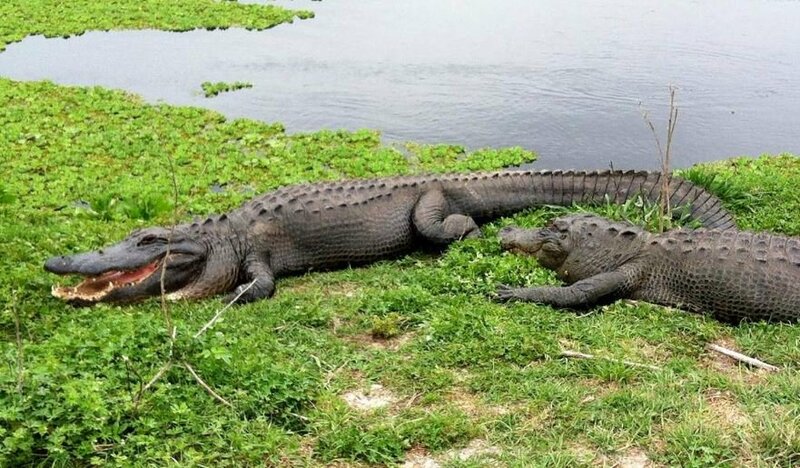 While Florida residents may be no stranger to the odd alligator sighting, as mating season ramps up, the hungry and horny reptiles are starting to turn up in the strangest of places. Recently, videos and photos from across the state have shown gators being found in swimming pools, on the streets, under vehicles, and even in a chicken wing joint’s parking lot, as their search for a mate (as well as food) makes them bolder than usual. On Friday, Fort Myers police shared a picture of an eight feet alligator that startled a local family when they discovered that it had torn through their back porch screen in the small hours of the morning. Later on in the day, a motorist captured another giant beast roaming around on a Fort Myers road. On April 8, a Palm Beach Gardens family was shocked to find a nine feet alligator in their backyard pool even though they had a fence guarding the whole perimeter. And the reptiles aren’t just being found in residential areas either, as seen in some April 6 photos from St. Andrews State Park where a woman snapped a gator lounging on the beach near Panama City. The Polk County Sheriff’s Office shared a post on April 9 that showed a gator parked right outside the South County Jail.